At Duende you will find tasty, traditional and no-nonsense tapas. No complicated dishes, but the authentic Spanish tapas as they are supposed to be. Patatas bravas, Serrano ham, calamares; you name it they have it! If you just like a small snack to acompany a glass of wine or a full meal consisting of the small tapas, everything is possible here. ondanks de drukte blijft de sfeer relaxed. Ik zou dolgraag een plaats willen reserveren in het "voorstellings lokaal'. Ik geloof dat dat niet mogelijk is. The food is great here, the service is awesome and the ambience is simple and casual. I ve been here only on weekday evening coz its perfect for conversation, not too loud. Its a little bright so not the place for your dim lit date evening but great place to hang out with friends, get a drink and chit chat. we tried calamari, fried chorizo and it was all good. fried calamari - pretty good. I completely disagree with the previous speaker! 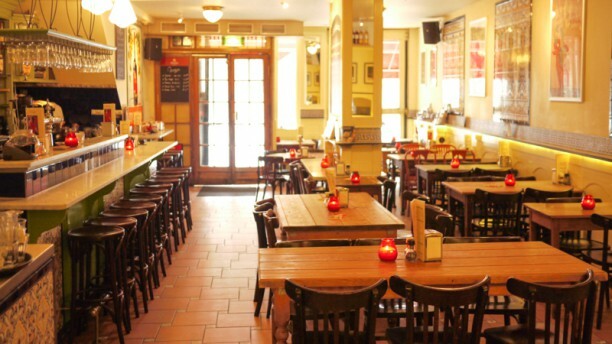 This is one of the best tapas bars in Amsterdam with great authentic food and friendly staff. It's all about food, music wine and flamenco! If u want perfection go some michelin star restaurant and pay €250 for ur meal!